Have Australia’s chances of success in England been reduced to ashes? IT is the expectation of many an expert that the result of the up-coming Ashes series is a foregone conclusion in favour of England; and for good reason too. The Poms are currently ranked number two in the ICC Test Championship rankings and with a talented and balanced squad within their midst, the home side will enter the series as warm favourites. On the other hand, much has been made by Australia’s less than ideal preparation for the biggest series on the test cricket calendar. From the outside, the once impenetrable Aussies are looking increasingly vulnerable and team unity seems to be in disarray. The results on-field have been far from encouraging either. It is evident that the scars inflicted by India in the 4-nil drubbing three months ago are still fresh in the psyche; a point perhaps best illustrated by Australia’s inability to give a yelp in the recent Champions Trophy. But amongst all the carnage, hope still remains for an Aussie revival over the coming months. The first step back in the right direction came in April, when for the first time in the past 18 months the selectors picked the best squad available. For too long, too much focus has been placed on playing bit-part, project players who are either not ready or lack the ability to hold down a position in the side. The negative aspect of this squad, however, is the fact that six of the seven batsmen are openers by trade, and this causes significant issues in regards to team balance. The biggest of which may well be where to put the supremely talented Shane Watson, who averages 43 at the top of the order but struggles when forced to come in against the spinning ball. Nevertheless, he should take first strike at Trent Bridge with Chris Rogers down the other end. It would seem the selectors have shown their hand by picking him in the squad and it would be nonsensical to select a 35-year old and not play him. The Victorian’s experience in English county cricket gives the side some much needed stability in the opening position and would help protect the brittle middle order which has been Australia’s Achilles heel in recent tours. So with the opening pair sorted, where does this leave the rest of the order? In light of events in the last week it would seem implausible to select David Warner, who would head into the First Test with next to little preparation and would be a huge risk in the eyes of the selectors. Despite his unrivalled ability to get Australia off to a flyer, his selection in the starting eleven is hardly guaranteed as shown by his often inconsistent performances both at home during the summer and in India. So that leaves Cowan and Hughes to pick up the slack. Cowan is a grafter and he is hardly going to have the pundits ticking the turnstiles off their hinges, but like Rogers he can occupy the crease and will have the defensive capabilities to deal with any onslaught from England’s pace trio- James Anderson, Stuart Broad and Steven Finn. He also doesn’t fit the mould of a traditional number three- a position which is usually occupied by the team’s best batsman- but for the reasons above he takes first drop and Hughes will slot in behind him at four. Much has been made of Hughes’ technical deficiencies last time he faced the old enemy, and question marks remain about his ability facing high class spin such as that from England tweaker Graeme Swann. But the adopted South Australian is a far better player than he was in 2009, and with a tighter defence and more rounded ability to play all around the wicket, Hughes looks far more equipped to deal with whatever is thrown at him. 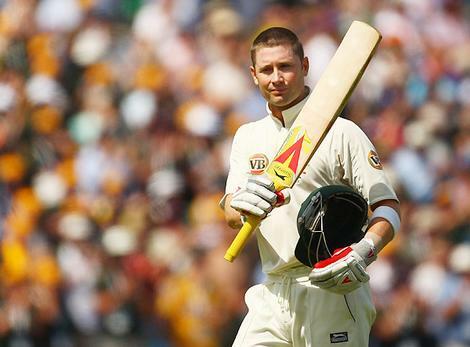 There is a huge push to move Michael Clarke up the order, but the fact of the matter is he bats far better at five. England may consider it cowardly by the skipper to hide himself down the order, but if he continues to make the volume of runs that he has consistently made over the past 18 months there is no need to move him. Next up is the all-important number six position, which for all intents and purposes should have been sown up by Usman Khawaja a long time ago. The knock on him though is that the lack of urgency in his cricket depreciates his value as a supremely talented batsman; particularly against fast bowling. Ashes tours to England have often been the catalyst for the rise in young Australian batsmen; Steve Waugh came of age in 1989, a young Michael Slater burst onto the scene in 1993, Ricky Ponting made the first of his 41 Test centuries at Headingley in 1997 and 2001 signalled the launch of Simon Katich’s career. It’s time now that Khawaja makes his own mark and justifies the faith shown in him by John Inverarity and his panel. However, Khawaja’s inclusion as the fourth left hander in the top six could pose issues for the Aussies when facing Swann, who will have the advantage of turning the ball away from the bat. The only other option that exists however is to include fellow left-hander Matthew Wade as a stand-alone batsman, but unfortunately he will miss a spot in this series due to the re-instatement of vice-captain Brad Haddin at seven. The bowling side of things also causes selection issues, but of a different kind. Aside from the spin department, Australia has a plethora of options in this area and will have the resources available to find any chink in an English batting line up that is not entirely settled. James Pattinson and Peter Siddle deserve the chance to lead the attack, while Mitchell Starc’s ability to swing the ball in English conditions could prove dangerous for the Poms’ inexperienced middle-order. Ryan Harris and Jackson Bird are more than handy replacements should anything go astray, while the much maligned Nathan Lyon will be determined to prove his doubters wrong in what shapes up as his biggest series to date. All the elements are there for the Aussies; in that there is no doubt. The big question there lies in their ability to win the big moments, which they have failed to do against England in recent series defeats. Who knows? The team dubbed as the worst ever to travel to England may not be so bad after all.